Editor's Notes: Foreign diplomatic envoys and journalists hailed the Chinese government's efforts to counter terrorism in the Xinjiang Uyghur Autonomous Region and recognized the significance of the region's vocational education and training centers after they paid a visit. The Silk Road Celebrity China Tour, which consisted of 12 media representatives from countries including Egypt, Turkey, Bangladesh, Pakistan and Sri Lanka, visited Xinjiang from January 9 to 16. The trip was made following diplomatic envoys from 12 countries visiting Xinjiang from December 28-30 at the invitation of the regional government. Global Times reporters Xie Wenting and Bai Yunyi talked with diplomats and journalists about their trip and their take on China's administration of the region. GT: Could you introduce your recent Xinjiang visit? During the trip, what impression did Xinjiang leave on you? Baloch: I was part of a group of diplomats from 12 countries including ambassadors and charge d'affaires that visited XUAR (Xinjiang Uyghur Autonomous Region) from December 28 to 30, 2018. We visited Urumqi, Kashgar and Hotan. It was an amazing experience to visit this land of immense beauty, history and culture. This was not my first trip to Xinjiang. Our visit reinforced my perceptions about this region that it has a multicultural and multi-ethnic identity, that it is critical for the development of the western regions of China and that it is an important node for regional connectivity under the Belt and Road initiative. GT: What impressed you most during the trip? Does it meet your previous expectation? Baloch: As I said earlier I had visited Xinjiang on several occasions in the past. Every time I visit I am impressed with the fast pace of development of the region. This policy of development and poverty alleviation is focused not just on the richer cities but also on the poorer cities and counties. 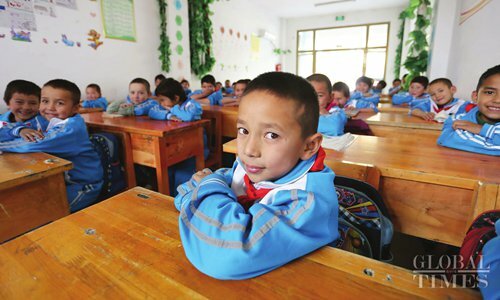 The development efforts at the grass roots especially in southern Xinjiang are remarkable and are aimed at improving the living standards of the people there. I was particularly impressed with village-run factories and SMEs (small and medium-sized enterprises) and the low-cost housing being developed for the villagers. I am confident that with such focused strategies to improve access of people to education, housing, livelihood, healthcare and social security, Xinjiang will be able to meet its developmental targets. GT: Did you visit the vocational education and training centers during the trip? What's your take on it? Baloch: Our visit program was quite broad which enabled us to get a glimpse of the situation in Xinjiang. During the visit we had the opportunity to visit the Xinjiang Islamic Institute, the bazaars, mosques, police stations, economic development and poverty alleviation projects and vocational education and training centers. We were given full and open access to the three centers that we visited in Kashgar and Hotan. The training program includes teaching of national common language (Chinese), law and constitution and vocational skills. The students also participate in recreational activities like sports, music and dance. We witnessed several skill classes being offered in these centers. During the visits to these centers, we had the opportunity to interact with both the management and the students. We observed the students to be in good physical health. The living facilities are fairly modern and comfortable with separate dormitories for men and women. They are being served hallal food. GT: Have you found the existence of forced labor, cultural or religious oppression? Baloch: During this visit, I did not find any instance of forced labor or cultural and religious repression. The imams we met at the mosques and the students and teachers at the Xinjiang Islamic Institute told us that they enjoy freedom in practicing Islam and that the Chinese government extends support for maintenance of mosques all over Xinjiang. I learned that there are over 30,000 mosques all over Xinjiang that form part of the religious life of the people there. Similarly, I did not see any sign of cultural repression. The Uyghur culture as demonstrated by their language, music and dance is very much part of the life of the people of Xinjiang. We saw that in official establishments, airports, subway stations, police stations or hotels the Uyghur language is being widely used. Even the copies of the Koran that we saw in the mosques and the Islamic center were translated into the Uyghur language. The most visible sign of protection of Uyghur culture by the government is the government-run bilingual kindergarten schools where children learn Putonghua as well as Uyghur language and culture from a very young age. GT: Xinjiang has been a region beset by terrorism. How did you feel about Xinjiang's security situation during this visit? Baloch: We learned that the recent measures have resulted in improvement of the security situation in Xinjiang and there have been no incidents of terrorism in recent months. The counter-terrorism measures being taken are multidimensional and do not simply focus on law enforcement aspects. Education, poverty alleviation and development are key to the counter-terrorism strategy of the Chinese government. GT: Based on your observation, do you think the current methods adopted by the Chinese government benefit Xinjiang's development? Baloch: I understand that Xinjiang's development is key to the western development strategy of China. We can witness signs of this development even in remote parts of the region including the less developed areas in the south. Development of infrastructure, airports, railways and the road network has enhanced connectivity of Xinjiang with the rest of China and with neighboring countries. Xinjiang is thus ready to play a critical role in the development of the Belt and Road initiative. Xinjiang is undergoing rapid industrialization through preferential tax policies to attract domestic and international enterprises. The governor of Xinjiang informed us that Xinjiang's pairing with better-developed provinces and municipal cities including Beijing, Shanghai, Guangdong, Shandong and Zhejiang has brought fruitful results. Today Xinjiang's GDP exceeds 1 trillion yuan ($144.2 billion). The hope is that peace and stability in the region together with policies for socio-economic development will further encourage investment in Xinjiang. This would also increase the prospects of the local population playing an even bigger role in development of the region especially with the growing focus on vocational training and Putonghua skills. GT: Did you visit the vocational education and training center? What did you see there? Rahman: I visited the Xinjiang vocational education and training center that Western media called "re-education camp." I saw learners there being taught Putonghua and laws and trained in different vocational trades. I also saw many of them playing outdoor games and performing cultural activities. I talked to the head of the center and a number of learners to know how they came to the center, what they were doing there and how they were being treated by the teachers or instructors. Most of the learners I talked to admitted that they either committed small criminal offences linked to religious fanaticism, extremism and terrorism, or were found to be inclined to fanaticism and extremism. I came to know from them that their families sent them to the center happily as they believe the center will motivate them to shun the wrong path and bring them back to the right path. Many learners said they were ignorant of the laws of China and the punishment for the offenses they were getting involved with. I categorically asked several learners if they face any sort of oppression or torture at the center and they answered in the negative. They said they were happy with the treatment by the authorities, and the food and accommodation offered by the center. The head of the center told the visiting journalists that every learner was trained in a vocational trade for three months after they passed the Putonghua and law exams. According to him, most of the around 1,000 learners, already graduating from the center, have embarked on their careers with some starting their own businesses and others joining different business entities. The head said the center even arranges jobs for the learners who cannot find jobs by themselves. According to him, there are around 2,000 learners in the center at present. GT: Xinjiang has been a region beset by terrorism. How did you feel about Xinjiang's security situation? Do you think the counter-terrorism methods used by the Chinese government are necessary? Rahman: We came to know that for Xinjiang, 2014 and 2015 were the worst years when the region witnessed a sharp rise in incidents of terrorism, religious extremism and separatism, the targets of which were mostly ordinary people. Such incidents started to decline following the government's heightened security measures and installation of a close surveillance system to protect the people. In any society it is the responsibility of the government to protect its every citizen from any ill and I believe the Chinese government and Xinjiang regional authorities are pursuing the right policy in this regard. I also believe that the government should keep an eye on law enforcement agencies to ensure they cannot go beyond their jurisdiction in discharging their duties. Abbas (pseudonym), a journalist who joined the Xinjiang trip this month. Abbas asked not to give his real name or nationality as he worried that if he honestly shares the positive things he saw during the trip, some people would slander him claiming that he might have taken money from the Chinese government. GT: What's your impression of the vocational education and training center? Did you suspect the interviewees were arranged to say words against their will? Abbas: When you listen to the word "camps," you will imagine some places with chains, tired and depressed people. But this was not the camps I visited during my trip. The center looks like a university campus because they have big classrooms and good dormitories. They also have cafeterias and large playing grounds. There were 40 students in one classroom, and I picked out interviewees on my own. We were free to ask anybody. And we were not picking students just from one classroom, but from almost all classrooms. I also saw some students in classrooms wearing their traditional caps and traditional dress. You can see from the photos that I've taken. They're all smiling and look in good condition. A man living under pressure would not have such an expression. GT: Do you think your country should also adopt the same methods of de-extremization? Abbas: My country is also plagued by terrorism. I hope my country can adopt some of these measures, such as setting up a vocational education and training center and carrying out poverty alleviation work, to help de-extremization. But they don't have so much money to do this. GT: Some Western countries and media outlets have launched vicious attacks on Xinjiang. What's your take on it? Abbas: I think the Xinjiang government has the right to take all these measures to push forward the social integration of its own people with the society. And if they make some plans to bring people's living standards up, it's a good thing and should be appreciated. Xinjiang borders eight countries, and none of these eight countries has complaints. Only Western countries, especially the US, which have nothing to do with Xinjiang, are criticizing the Chinese government. But if the people in Xinjiang are lifted out of poverty, if they are given houses and jobs because factories are set up in the area, is it bad? I don't think so. GT: What do you think of Uyghur people being taught Chinese? Abbas: I think the government is very right to make people the useful part of society, because we were told that most of the Uyghurs cannot speak Chinese. But if you cannot speak the main and common language of your country, how can you compete? How can you run a business?